Craft Editions visited Cockpit Arts Holborn on 4th June 2016. Cockpit Arts is an award winning social enterprise and the UK’s only business incubator for craftspeople, housing up to 170 small businesses at two locations in Holborn and Deptford. Craft Editions visited the open day at the Holborn studios and here are 5 that stood out to us for their handmade craftsmanship and design. Catarina Riccabona - Catarina is an award winning textile designer and weaver. She produces beautiful bespoke cushions, throws and scarves using traditional handweaving techniques principally from linen, hemp, wool and alpaca. Catarina takes inspiration from tribal textiles, vintage grain sacks and linen towels, as well as from textile memories from childhood. Find out more about Catarina Riccabona here. Camilla Lee - Camilla is a designer maker specialising in the use of ceramic and wood for sound production. Resound is a series of handcrafted amplifiers for iPhones that connects modern technology with the traditional gramophone. Camilla was awarded the NADFAS David Bell Memorial Award in 2015 and given a place at Cockpit Arts incubator for a year. Find out more about Camilla Lee here. Beth Lewis-Williams - Beth creates bespoke porcelain lighting working between the worlds of art, design, craft and technology. Her work exploits the traditional world of lithophanes and she individually hand carves each piece. The full impact of Beth's work comes to life when a piece is illuminated and shows the urban scenes that she explores in her work. Find out more about Beth Lewis-Williams here. Justin Oh - Justin produces a striking range of bags and accessories, as well as made-to-order clothing. He makes each piece in his small studio at Cockpit Arts with great attention to detail. Justin’s background is steeped in design having worked in the international fashion industry in London, Paris and Tokyo. Find out more about Justin Oh here. Beatrice Larkin - Beatrice is a textile designer specialising in weave. 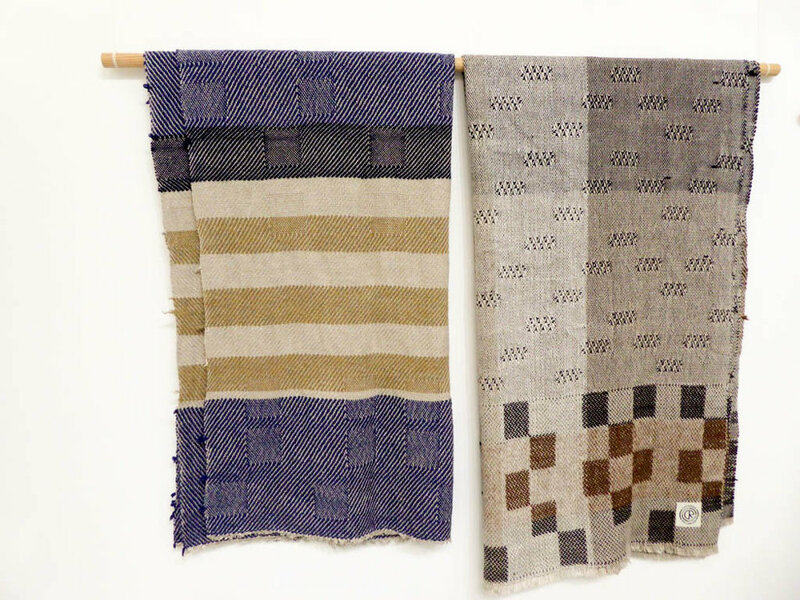 She uses traditional Dobby weaving alongside the capabilities of the Jacquard loom to create fabric that is striking in its geometric design. Beatrice designs and samples the fabrics at her London studio and works with a mill in Yorkshire to manufacture her woven blankets and throws. Find out more about Beatrice Larkin here. Find out more about Cockpit Arts here.